The NEW TOA M-9000M2 Digital Matrix Mixer redefines the mixer category, by combining a modular matrix mixer and digital signal processor (DSP) in a compact two-rack package. This versatile new modular unit is ideal for multi-zone paging, music distribution and room-combining applications. The M-9000M2 combines an enhanced GUI programming interface with exceptional audio quality. It enables easily configured custom systems with up to eight mic/line inputs and eight outputs. The M-9000M2 has two output channels with built-in DSP, including ten-band parametric EQ, compressor, delay, and more. Input and output modules include additional DSP. A new integrated operating mode provides powerful functionality for both simple mixing and complex multi-zone paging applications. 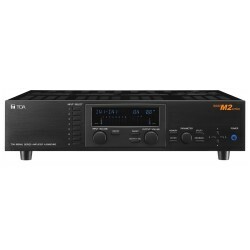 Features include telephone zone paging, automatic microphone mixing and ambient noise control. TOA D-001R Dual Line Input Module for M-9000M2 Matrix MixerDual Line Input Module with DSP for M-900..
D-001T Dual Mic/Line Input ModuleTOA D-001T Dual Mic/Line Input Module for M-9000M2 Matrix MixerThe ..
C001T 8-Channel Input/Output Control Expansion Module for 9000 Series AmplifiersTOA's C-001T is..
TOA	T001T Dual Line Output Expansion Module with DSPTOA's T-001T is a plug-in module desig..
RC001T M9000-Series Remote Control Interface ModuleThe RC-001T is an interface module to connect bet..
AN-001T Ambient Noise Controller ModuleThe AN-001T is a plug-in module of 2-channel ambient noi..
AN-9001 Ambient Noise Sensing Microphone for M-9000The AN-9001 is an electret condenser microph..
ZP-001T Telephone Zone Paging ModuleThe ZP-001T is a zone paging module designed for use with t..
SS-9001 Speaker SelectorThe SS-9001 is a speaker selector used with the ZP-001T zone paging mod..
ZM-9013 Remote Control PanelDesigned for exclusive use with the 9000M2 Series amplifier, the ZM..
ZM-9001 Remote Control PanelThe ZM-9001 is a remote control switch/volume panel used with the M..